Picture this—a band of twelve musicians decked out in white busboy jackets with red carnations and a female singer in 1920s flapper-style dress, necklace and headband. Aside from the typical jazz band instrumentation of saxes, brass, piano and drums, the band features banjo, tuba and violin. They play only music written before 1936. It’s the Hotel Paradise Roof Garden Orchestra’s sixth monthly show at Paulie Gee’s pizza restaurant/bar, just off The Avenue (W. 36th St.) in Hampden. Though it’s a rainy Sunday, nearly all the venue’s sixty seats are filled, some by people in their twenties. Shortly after retiring to his native Baltimore from Norfolk, where he had a similar band for thirteen years, Lynn Summerall organized this ensemble in the summer of 2017. They began rehearsals that September and played their first gig at Paulie Gee’s the next March. Asked why he organized this type of band, Summerall, who had careers in theater and public radio, described a wide range of personal musical tastes, from ‘70s and ‘80s rock, to country, to modern jazz. He also talked about falling in love with “this boop-boop-pa-do” music at the age of ten. That love is the basis for his putting nearly fifteen years into two incarnations of the Hotel Paradise Roof Garden Orchestra, but his choice of genres also has a practical side. Summerall sees it as a stylistic niche different from those of all other big bands in this area. Hotel Paradise’s show included very little improvisation, but band members performed these very good arrangements with spirit, taste and precision, and their mixture of sweet and hot music evoked the style of many pre-Swing Era jazz bands. Veteran jazz players Leo Brandenberg and Steve Scheinberg (alumnus of the BJA Big Band), said they really enjoy performing with this ensemble. Audience member Jonathan Jensen, who plays bass in the Baltimore Symphony, is a big aficionado of this genre. He has been to New York to see Vince Giordano (whose band The Nighthawks provided the music for television’s Boardwalk Empire) and Washington, DC to see Germany’s Palast Orchester. Jensen said it was a pleasant surprise to witness a local band playing in this style. 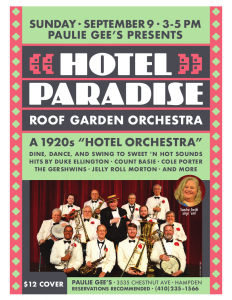 The Hotel Paradise Roof Garden Orchestra returns to Paulie Gee’s on Sunday, October 14, 3 – 5 p.m. Reservations are recommended. They appear on the second Sunday of each month.